Julie Ann Walker might be the only non-paranormal author on my auto-buy list. That's how much I love this series. (It's also one of my go to slump busters.) 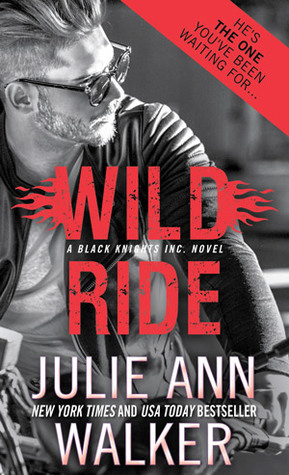 Wild Ride has some great action scenes and wraps up the HEA for two characters that have both been a big part of the series from the beginning. I was crushed when Ozzie was injured in an explosion in an early book. Seeing him struggle with the pain of his injury still breaks my heart a little bit. But it's nice to see him getting into the action, even it's not on an official mission. I hope this means we'll see him back in the field, maybe in a slightly different role, in the next book. One thing that's unique about this story is that most of the guys are completely absent. It's normal in the series to have some of the team off on a different mission, but we normally at least see them around the shop. Instead the women of BKI are running things while their husbands are in the field, which is kind of awesome. I'm a big fan of a friends to lovers story and, like anyone else who's read the BKI series, a big fan of Ozzie. But his romance was painful to watch as they both constantly missed the signs. I also felt like most of the friend part of his relationship with Samantha happened during earlier books and I wish I had seen more of it on the page. It's possible that I have seen more than I remember though. I guess maybe what I needed was context for the references to earlier moments, what the team was doing while they happened, to help me place them in the series. I also don't remember exactly when Christian joined the team and he's a big part of this story. Christian reminds me of Scotty in Kristen Callihan's VIP series, which is definitely a good thing. And I loved his relationship and his insult banter with Emily, another new addition. It looks like the two of them should be starring in their own book soon, which I'm really looking forward to.